Auctioning Items Like - Compressors of All Sizes, Attachments, ATV/4 Wheelers/Side by Sides,Forklifts,Manlifts,Skid Steers,Backhoes,Dozers,Excavators,Graders,Logging and Farm Equipment and Much MORE! Sales Tax : 9.5% - Sales tax applied to invoice total, including Internet Premium. Payment Instructions: To all Bidders - Start time, Catalog, Terms & Condition are only for online bidding. If bidding onsite please visit www.blackmonauctions.com for onsite start time, catalog and terms and conditions. HOW YOU REGISTER IS EXACTLY HOW ALL INVOICES, TITLES, AND RELATED PAPERWORK WILL READ. WE DO NOT CHANGE NAMES, ADDRESSES, OR TAX STATUS ONCE YOU HAVE REGISTERED. NO EXCEPTIONS!!! Online Buyer's Fee - 6% Buyers Fee will be charged on the balance above $2,000.00 and a 14% Buyers Fee will be charged on every item up to $2,000.00. Invoices - All invoices will be generated and emailed after the end of the auction and not before. All invoices are sent to the register email address on your account. Paid invoices will not be sent out automatically. Buyer must request a paid invoice by send their request to mshelle@blackmonauctions.com. Please allow 48 hours after payment has been made before sending your request. Buyers do not need a paid invoice for pickup unless Broker/Hauler Company request one. We verify all online Buyer's purchases are paid with accounting before releasing. Payment Due: All payments must be submitted to Blackmon Auctions by one of the approved methods within 24 hours of the closing of the auction. All open accounts after the due period will be sent to collections and all online accounts flagged from bidding. Excepted Payment Methods - Wire Transfer (Preferred), Credit Card (3% Service Charge will be added), Overnight Check with Bank contact information to verify funds, Cash paid at our Little Rock, AR Office or onsite. Sales Tax: May apply. Please make sure your tax ID number is listed on your Proxibid Account. If we are not provided with the number, taxes will apply. International Bidders - we do not remove taxes just because you are an International Bidder. We have laws we must go by or during an Audit we are fined. International Bidder, if you do not have a US Tax Exception Number you must do the following to have your taxes refund back - this also applies to everyone else that is shipping over State line - You will need to send us a Bill of Lading from an ICC or MCC or the like Carrier (QUICKLY) SO WE CAN REFUND YOUR TAXES. It changes the transaction to an across the state line interstate transaction. International Bidders may be able to send us copies of their export papers. That must be approved by our Accounting Dept before taxes are refund. Terms – This auction is governed by United States UCC Laws which places responsibility on you, the bidder – We have provided time and opportunity for all buyers to inspect the items before they bid AND this is the BUYER’S responsibility. All items will be sold in the “as-is” condition. Shipping Instructions: Blackmon Auctions does not ship or arrange shipping for Buyers. Buyers are 110% responsible for removal and shipping their items from auction yard. Removal of Items: Pay as directed above. When sending your staff or trucking company SEND the INVOICE we send you listing your name and each item that we email you. Otherwise your items will not be released. Also give your trucker the above address and directions! Please remove all items within one week of the auction. Please plan accordingly. Watch for the email with your invoice details! Preview Date & Times: All items can be inspected 2 weeks before auctions day or when items arrive onsite during regular business hours - Monday-Friday from 8am to 5pm. For more information please contact us. Checkout Date & Times: Removal deadline is 1 week after auction day. Payments must clear bank before items will be released to buyer. Buyer must print and provide invoice sent to them for items to be released. Monday - Friday 8am to 5pm. NO Weekends. Driving Directions: 425 Blackmon Road Lonoke,AR - GPS Blackmon Road Lonoke, AR. From I40 take exit 169, turn South, Go 1 Mile and yard is on the right. Monday - Friday from 8am to 5pm Sharp. After hours if available will be charged a fee. HOW YOU REGISTER IS EXACTLY HOW ALL INVOICES, TITLES, AND RELATED PAPERWORK WILL READ. WE DO NOT CHANGE NAMES, ADDRESSES, OR TAX STATUS ONCE YOU HAVE REGISTERED. NO EXCEPTIONS!!! To be approved to bid: To all Bidders - We do not consider the time or amount of items bought though Proxibid for approval. We have our own rules and terms for approval. 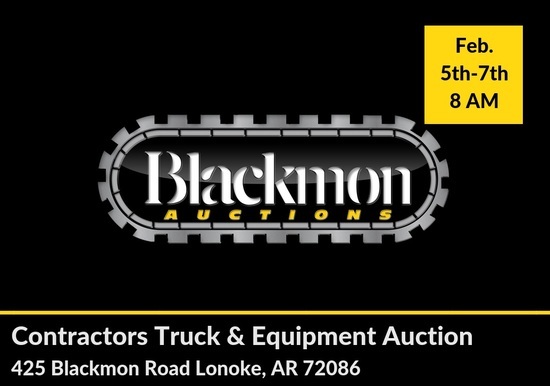 If you are a current and established customer with Blackmon Auctions, register and send a quick email to doug@blackmonauctions.com and billy@blackmonauctions.com. Include your Blackmon Buyer Number and/or the name you buy under. If not an established Blackmon buyer we will need much of the following: - A letter from your bank and banking & banker contact information - Your Business Address - Your Web Site - Business Reference - An indication of (Item(s)/Dollar Amount) what you plan on bidding on in this auction - Acknowledgment from you that you understand the terms and you will pay for those purchases the day of or the day after the auction via wire transfer and remove those purchases within one week of the auction. Special Approvals may require a 10% deposit 48 hours before auction day. If you plan to use a lender to make payment, you must contact Blackmon Auctions 72 hours before auction day for approval to bid. You've been outbid to h****g! to YOU!